Today, April 21, 2015 is G-Day. Yes, Google has done it again. This time it’s MOBILE. Now the time has come that having a mobile-friendly site is no longer a choice, it’s a must. That is if you care about being found on major search engines. Google has announced that starting today, there will be a major update to its mobile search algorithm. 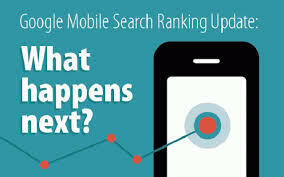 This update will change the order in which websites are ranked when users search for something using smart phones. For many business owners, this could mean a disappointing and dramatic drop in website traffic. If your site is not mobile-friendly, it will be demoted and will receive lower rankings than sites with mobile responsive features. That’s a downfall for local businesses who rely heavily on foot traffic based on search results. In the midst of what many are calling Mobilegeddon, I must say that Google’s focus on user experience is not all bad. Upgrading to a mobile-friendly site is a great opportunity to engage more with your customers while having a site that’s easy to use and that you can be proud of. If you would like to know if your site is mobile friendly contact us at info@BigHitCreative.com for an analysis. Let us help you stay relevant. The most common misconception about SEO.